Green peas were/are seasonal at my native. When I was a kid, we used to bring it from Belgaum once or twice in large batches. Shelling these peas was a big job then. Aayi had few staple dishes that she would prepare every time peas were bought. Among them, my most favorite dish is this kurma. She serves this with hot puris. Now I make this often with chapathis also. I use the frozen peas here, which are always available in my freezer. Heat a little oil and fry coriander seeds, pepper, cloves, cinnamon, red chillies, fennel seeds. Grind with coconut. 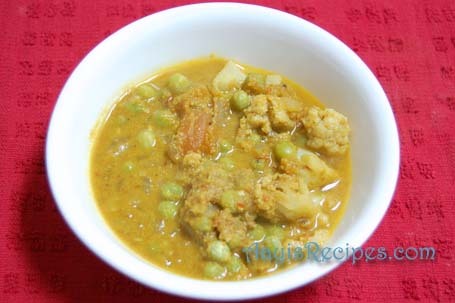 Cook peas, onion pieces, potato pieces, cauliflower, tomato pieces together in a vessel with enough water. When almost cooked, add ground masala and salt. Bring it to boil. Serve with puri or chapathi. Yes anu. Fennel seeds are also called as badishep. Hi,I jus wanted to knw…..hve I to use frozen peas for this or those green peas tht need to be soaked overnight? and hve i to fry corriander,pepper etc etc in oil together or hve i to fry it one by one?wht abt the coconut hve i to fry tht too? Rhea, you should use the fresh or frozen peas (not the dry ones that needs soaking) for this dish. You can fry all the spices in oil together(taking care not to burn any of them). Coconut need not be fried. This kurma tastes real great…i tried twice to get it right, first time didnt have fennel seed…it sure does make lots of difference…..since i have lots of faith in your recipes, i didnt give up after first time. I tried again with fennel seeds and it came out really good. Thanks. Hi shilpa, i bought a pack of frozen peas yesterday and tried to cook a few in the microwave it did not cook, should i only use the cooker to cook these? Shilpa: Swetha, I cook them directly on stove top. They cook pretty fast. amazing dish.mom calls it garammasala bhaji which she used to make so often. I had so forgotten about it and once I saw your recipie, I tried it and charged my thoughts back 🙂 Thanks a lot Shilpa! I guess iam the first male to leave a comment on this dish! Gonna try this today….hope it comes out good, thanks for the recipe. This is an awesome recipe! I was looking for good saagu recipe to go with pooris, this is just perfect with pooris! and easy too…fennel tastes so good.Thanks Shilpa!